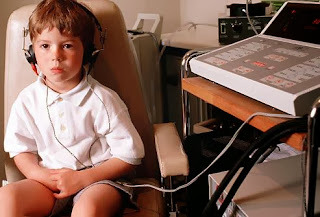 Behavioral Audiometry: to determine the softest sounds that a child can hear (thresholds). Sounds are presented via air conduction (soundfield, headphones or insert earphones) and bone conduction. 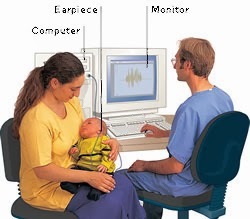 Behavioral Observation Audiometry (newborns and infants): involves watching behaviors such as sucking, eye widening and startles in response to sound. Visual Reinforcement Audiometry (toddlers and difficult-to-test children): uses animated, brightly lit toys and videos as reinforcement for head turns in response to sound. Play Audiometry (older children, 2 1/2 years and older): uses games (drop a block in a box, put a puzzle piece into a puzzle, etc) to teach a child to respond to sound. Speech Audiometry: These tests use spoken words and sentences rather than pure tones, to assess sensitivity (threshold) or understanding (intelligibility/discrimination) of speech. Immittance testing (Tympanometry and Acoustic Reflexes): to determine how the eardrum and middle ear structures are functioning. Tympanometry can assist in determining whether there is fluid behind the eardrum in the middle ear space, and whether the eardrum moves normally. Acoustic reflexes determine whether the middle ear muscles and acoustic pathway to the brain are working properly. Otoacoustic Emissions testing (OAE): measures the function of structures in the inner ear. The OAE are sounds (“echoes”) that are produced by the inner ear in response to sound stimulation. If the OAE is normal then we assume that structures in the inner ear are functioning normally. The echo is found in most normal hearing individuals, so if echoes are present during OAE testing then the likelihood is that hearing is normal. If the echo is absent it could indicate that a hearing loss is present and referral for further testing such as Auditory Brainstem Response testing is made. OAE can be measured in newborn as well as older children. It is often used to get an estimate of inner ear function in children with developmental disabilities who cannot give behavioral responses. Auditory Brainstem Response testing (ABR, BAER): ABR testing is a measurement of the response to sounds from the lowest part of the brain (the brainstem). This response measures degree of hearing as well as neurologic function. Small electrodes are placed behind the child’s ears and on top of the head. There is no discomfort at all, in fact, the child will sleep through the testing. Earplugs are placed in the ears and sounds are presented. The electrodes pick up the response from the brainstem and send it to a computer screen. A normal brain response consists of characteristic brainwaves, and the decibel level where these waves are able to be measured represents the hearing threshold. ABR is often used to get an estimate of hearing thresholds in children with developmental disabilities who cannot give behavioral responses. Sedation is sometimes required for children who cannot sleep for the several hours it takes to do the testing. In such cases, the family will be referred to a medical facility for sedation and testing.